Mix the marinade ingredients. Add the steak and let sit for 2 hours, the last hour at room temperature. Grill steak to medium. Let sit 10 minutes before slicing. Slice in thin slices against the grain of the beef. If any juices start running onto the cutting board, be sure to collect them in the pasta bowl. Grill Bok Choy for a few minutes to brown slightly. Cook udon 5 or 6 minutes. Taste and make sure it is a nice chewy but not soggy texture. Strain and rinse in cold water. 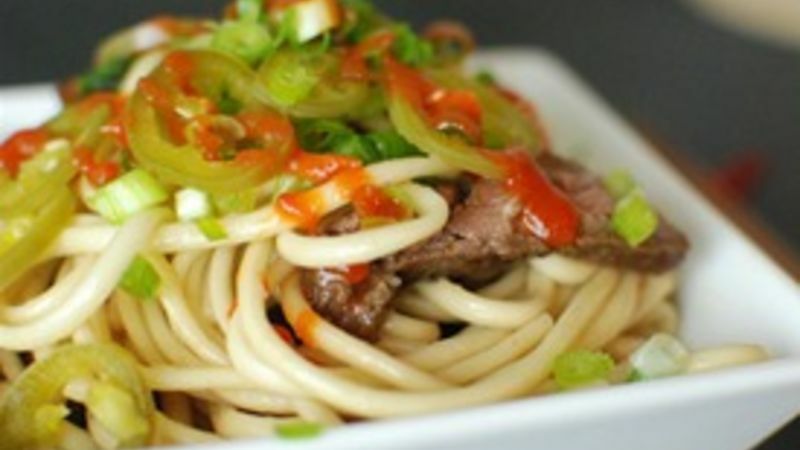 Add noodles to steak and bok choy. Toss so everything is coated. Serve and top with jalapeños, scallions, and sriracha. The idea to make this noodle dish really just came out of nowhere, but I am glad it popped into my head because it was one of the best things I have eaten in months. Grilled skirt steak and bok choy with udon noodles is a great weeknight summertime dinner. It's easy to pull together, and all you have to do is light the grill and boil some water. In fact, most Asian markets sell perfectly good pre-cooked udon, so if you want to skip the boiling water part, go ahead! As a topping, I quick-pickled some jalapenos. You can follow the 10 minute recipe here, and keep these guys in your fridge for weeks. Lightly toss the bok choy in sesame oil and toss that on the grill before the steak. Just a few minutes a side will char them nicely but leave a good crunch to the vegetable. The marinated steak on the grill. The sugar in the marinade makes this smell awesome as it hits the grill. It is very important to slice the beef against the grain to keep it nice and tender. See all that juice from the steak? Be sure to collect that in the pasta bowl! I like to get the thickest udon noodles available. As I mentioned earlier, most Asian markets have these already cooked in the refrigerator section. Tossing everything together. Make sure you rinse the noodles before tossing them with everything else! Asian style noodles are very starchy and need to be rinsed after boiling. Topped with the pickled jalapenos, some scallions, and of course, sriracha! These noodles were amazing! I thought this was best at room temperature, but feel free to eat it at the temperature you desire. Dan Whalen ate half of the steak before realizing he needed to save some for the noodles. He has been blogging for over 3 years at The Food in my Beard; check Dan's Tablespoon profile often to try his recipes with creative international spins!